Trying to forge past the glaciers again, the trio got lost in the shifting ice and were yet again forced back. Camping for the night, they were attacked by wildlife and scattered by a ferocious predator, and upon regaining their wits they noticed Quathari was gone. Cog & Onget both hoped Quathari could be found, but as the days went by hope began to falter. With the glacier expedition having been a rousing failure Onget and Cog began turning towards the only expanse left unexplored; the southwest. Days and days went by with the Dwarves' nourished by what crabs they had pilfered from the ocean, supplemented by a particularly hardy wolf Onget ambushed along the way. As time went on the drunks remarked how little of anything there was, they had entered a true wilderness where not even Elf nor megabeast entered - there was nothing but the wilderness, the cold jungle obscured by fog for miles and miles around. Deciding to make the best of the foul weather, Cog practiced his sneakiness with some hunting. Onget did most of the successful hunting which fed them throughout the expedition, but Cog did manage to successfully catch a turkey! Onget: Why don't we vanquish a great beast and become heroes? The glorious Onget and Cog! 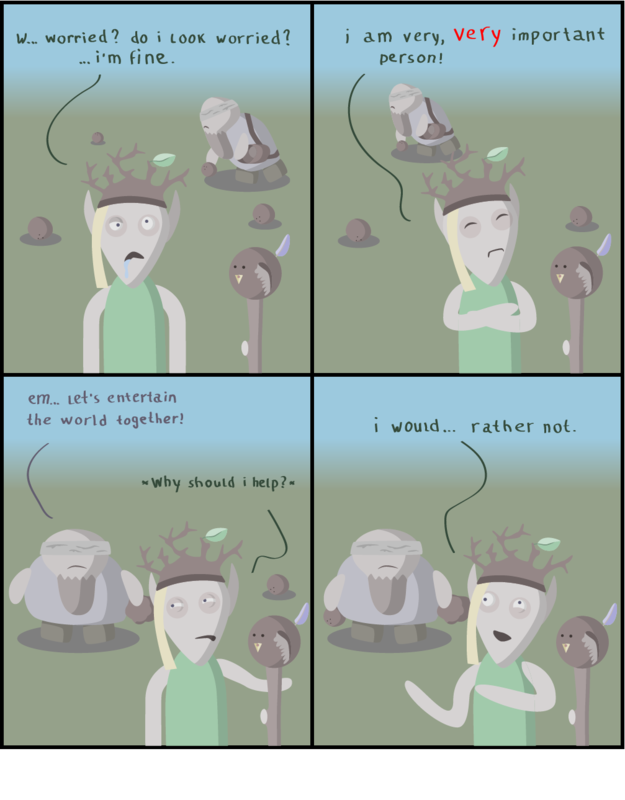 Dwarves who kill colossi! 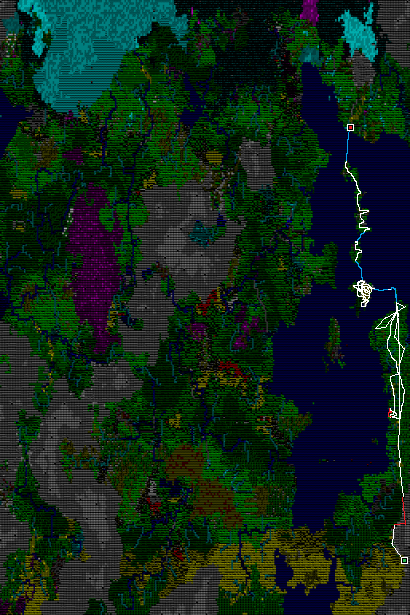 Cog: How I long for civilisation. . .
'However or wherever it is you fell Quathari Toothbride, here's hoping you were devoured by nature, the Elfy way to die valiantly - and live forever.' A week since their last sighting of Quathari, Cog and Onget accepted that they had likely been killed by an apex predator of the wilderness. A funeral was held in absence of a burial for their lost friend, as the party grew smaller again. After days and days of roaming throughout the wilderness of the frozen jungle, Cog and Onget decided to backtrack all the way to the north, effectively rendering their explorations to the northwestern peninsula pointless. 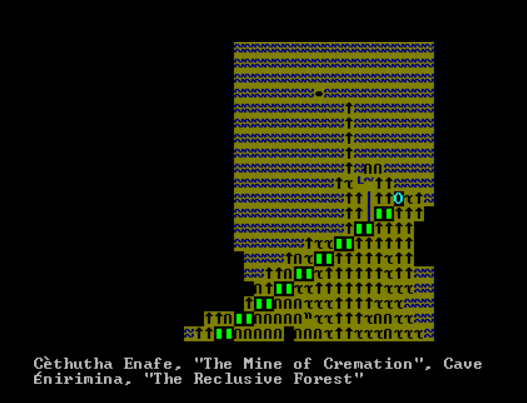 They decided to seek out the Mine of Cremation. If that didn't give the duo access to the caverns, they decided that they would make the long, long journey south back where they'd set forth, or possibly camp out the seasons until winter to see if the oceans freeze over. 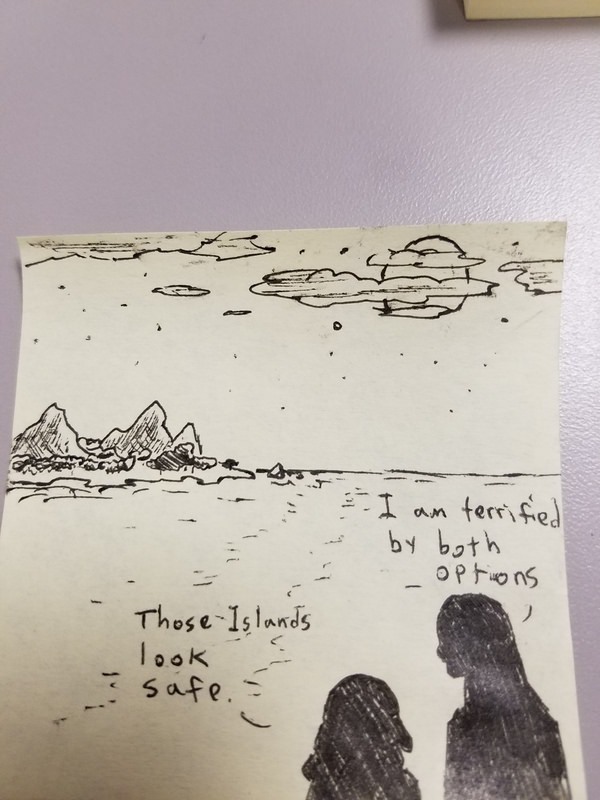 After days of travel the two Dwarves reached the northernmost isthmus of land, the closest trip away from the cave to the subterranean world, sitting some way away on an island amidst the ocean. They had enough food and water to last a good number of days, potentially weeks; however upon reaching the ocean Cog was met not with a frozen glacier but with the rolling waves. Spring had thawed the ocean, and our efforts were in vain. With some great alarm we set upon returning to civilization to plan our next journey, it was dangerous to stay in the wilderness. This was of immense alarm because the closest Elven settlement we had knowledge of was no less than 4-5 days travel away as the crow flies. I had a bad feeling in my gut about this, but with trepidation, we roasted some crab over a beachside campfire and set out back into the wilderness. The first day of travel was fine, yet by the second Cog and Onget were hunted. The first to notice was Onget, who leapt into battle at once. Cog dropped his barrel full of water and his bag full of supplies; they merely encumbered him too much to fight, and Cog was not going to abandon Onget to this beast. Cog charged into the fray with his warhammer drawn, this was probably a mistake, but it was worth it if it meant saving Onget. The sounds of battle rolled through the forest, it was a bear - the bear did not behave like anything Cog had ever fought before; it would strike him and tear his flesh before melting away into the surroundings with a quietness which seemed so out of place on a creature so large. Cog could hear to his right, behind some trees the clear sounds of violence. It was unclear whether Onget or the bear was winning, but the fight was definitely to the East - thus Cog charged into furor. Cog swung widely, moving as close to the bear as possible, biting it, punching it, but the bear seemed to pay no heed and kept ripping and tearing - it was miraculous that Cog was not disemboweled. With his left hand Cog managed to grasp the bear's throat, keeping the worse of its biting attacks away from his body. He strangled, constricting, the bear growing desperate and off-balance. Hammer strikes to the head seemed only to make the bear angrier, no bones broken with only bruises to show for his efforts. It came to an end when the bear managed to land a square hit directly through Cog's upper body and into his heart. Cog grew weaker, blood loss taking its toll. Cog passed out from the pain. Unconscious, with a black bear furiously striking atop him. Time went by slowly, I feared I was counting the seconds until deceasement. The world was grey, like it always was. 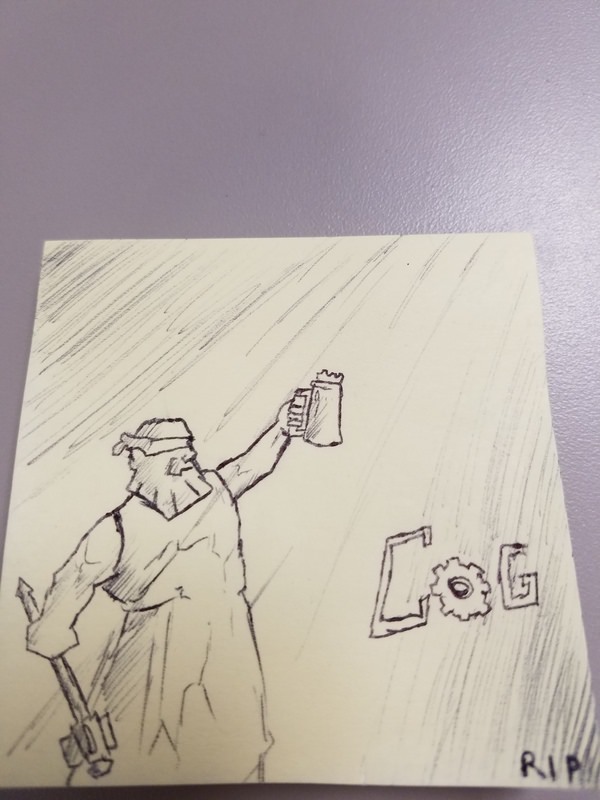 'A Statue of Cog the Blind Drunk. 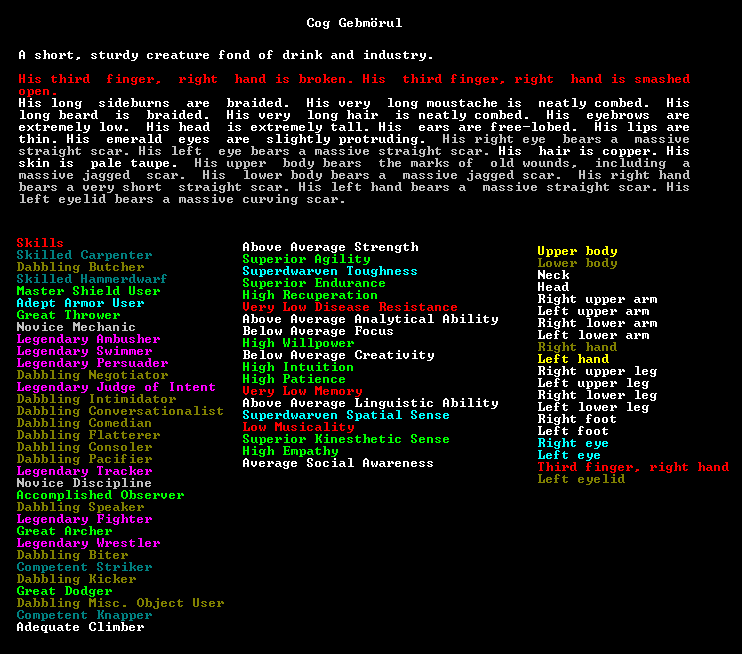 The Dwarf is triumphant,' by the master craftsdwarf Dunamisedos. But Cog awoke. He wasn't dead. He stood up, faintly. The forest was silent, not a sound to be heard. By his feet was the corpse of black bear that nearly killed him. Against all odds Onget and Cog had mortally wounded the bear before succumbing to their own injuries. Cog sought to retrieve his supplies and congratulate Onget, but the worse was to come. Pale from blood loss, weary from tired struggle and in pain from a bear attack, Cog was living, but his friend was not. Cog was halfway into the grave, alone and in the wilderness. Cog picked up his bag and barrel, butchered the bear and pilfered whatever he could carry. After considering leaving Onget's body, Cog decided to ultimately take it with him. Cog ate well, drank well, fully expecting this to be their last day with the living. Either he would disappear in the night or make it to the distant elf settlement, three days travel away. All of that changed when Cog found an Elf retreat in the distance he did not have on his charts - he actually had a chance to make to civilization before dusk. Apologizing to his old friend, he set down Onget's corpse and buried him in the wilderness. He would not be able to give Onget anything more than a rushed burial, nor could he carry him to the Elven settlement before nightfall. The shame bit Cog's heart as he trekked onwards unencumbered. Into the night Cog traveled, something in the distance was following him and he prayed the silence of the forest would not be broken by cackling. Roaredembraces was a welcome oasis in the night to behold, the pungent stench of Elf telling Cog he had reached safety. Cog slumbered amicably, a deep dreamless sleep, sleeping until the sun rose above the horizon. No Elves disturbed the slumber of this scarred, bloodied and well-armed Dwarf, no Elves were to be found, but wherever they were hiding, they kept the bogeymen away. 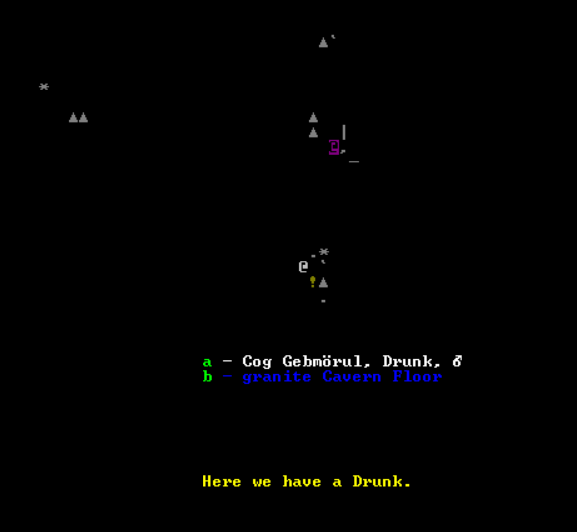 Whilst on the way back Cog encountered yet another uncharted elf settlement where he was stopped by an elven patrol. The patrol was friendly in receiving him, and were too preoccupied with the utter infestation of bandits and cavern creatures in the surrounding area to care for Cog. One exception is with Lesana Ririliilifi, who was nearly a thousand years old and utterly bored, seeking now glory or death. Cog was confident that he was 100% likely to provide one or the other. The bear skulls and the scars covering Cog certainly proved to this peculiar sword-Elf that he was serious about death or glory. 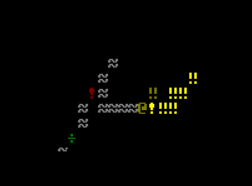 Asen, killed in an ambush by a Blind Cave Ogre. Quarathi, presumed dead after a cougar attack. Onget, dead after a black bear attack. Cog sat by the campfire with Lesana, and began to tell the swordself their stories. He was an awful storyteller, but Lesana continued to be interested. Whilst going around one river on his way to a southern Elvish Retreat (intending to sell much of the produce harvested from the bear in exchange for mangoes), Cog stumbled upon an unchartered cave. 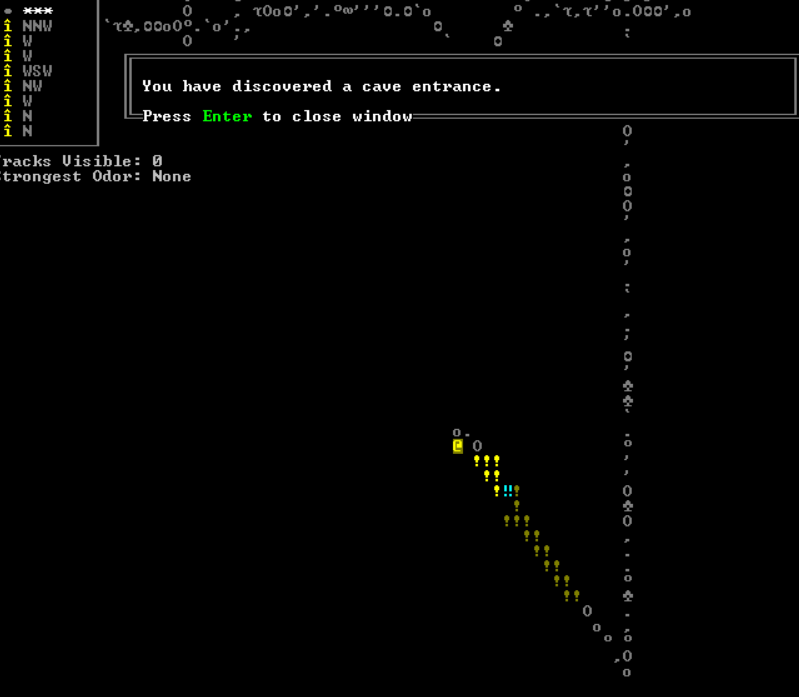 Onget, Quathari, your efforts were not in vain - we found our cave! Cog the Blind Drunk and Lesana the Swordself roamed about exploring the cave, searching for the cavernway. Cog knew he was getting warmer when the silt and grass gave way to rough granite, cool to the touch and familiar. On the topic of Lesana, I got to learn Lesana's personality, particularly their bravery. We were ambushed by some enemy, however the enemy was only hostile to Lesana's civilization and so had no issue with me. Amusingly this meant this enemy soldier was chasing after Lesana whilst I had to chase around the panicked Lesana, who after some great talk of being a champion warrior - fled, terrified. I'm not sure how to feel about Lesana's bravery. All of the white text was Lesana talking. Lesana was very fond of talking, so I resolved to call her chatty Lesana, or Lesana the chatty. Whilst the immense level of noise generated by such a companion would ordinarily be immensely irritating, in this case it was very useful in gauging where she was, Cog could always tell whether she'd caught up with him or not because she'd always be making noise! Behold: Chatty Lesana, armed with wooden sword and shield, may her adventures lead her to glory or death! After a great deal of time listening to chatty Lesana, Cog finally found it: the distinct grooves of granite cavern floors. Down there was the caverns and with it - our ticket to the island Elves. 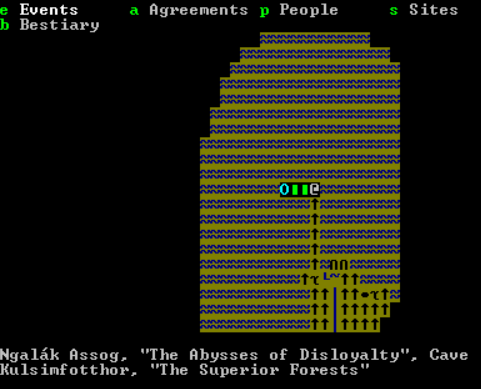 As far as I was aware, I'm not sure if the island Elves had ever had contact with other civilisations before. 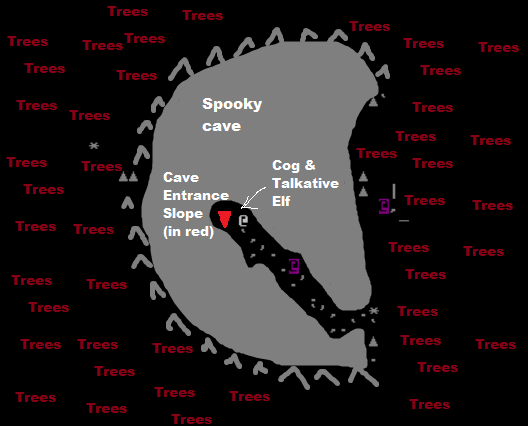 Cog and Lesana discussed the merits of traversing the cave and the caverns versus the oceans, and determined that the subterranean presented the smallest chance of dying horribly, and the highest chance of reaching the island elves. 'Cog and Lesana consider their options,' a most pleasing engraving by Dunamisedos. 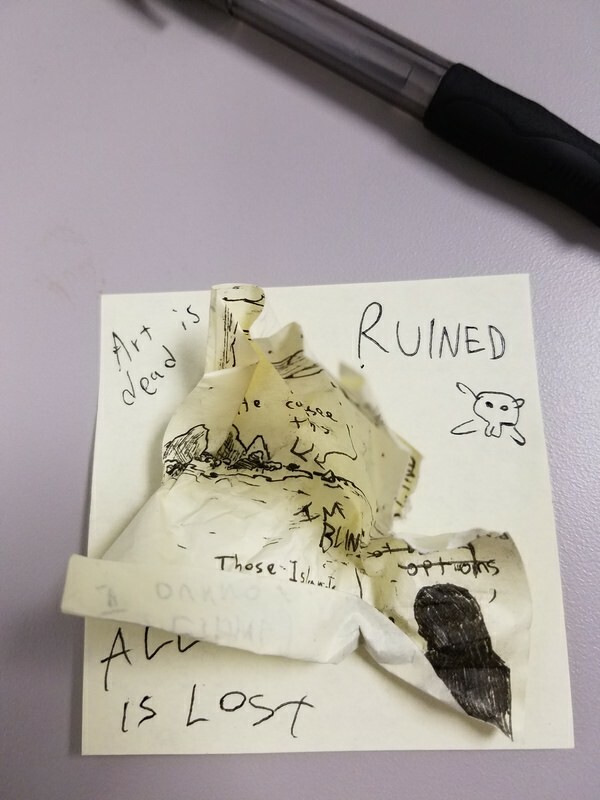 'My artistic license is revoked,' a delve into the craftsdwarf Dunamisedos's mind after receiving feedback regarding Cog looking at an island. 'Abandon all hope ye who enter into the valley of death, for I am the reaper come to collect ye wages, for the wages of sin are death,' the most excellent result of Dunamisedos entering a fell mood. 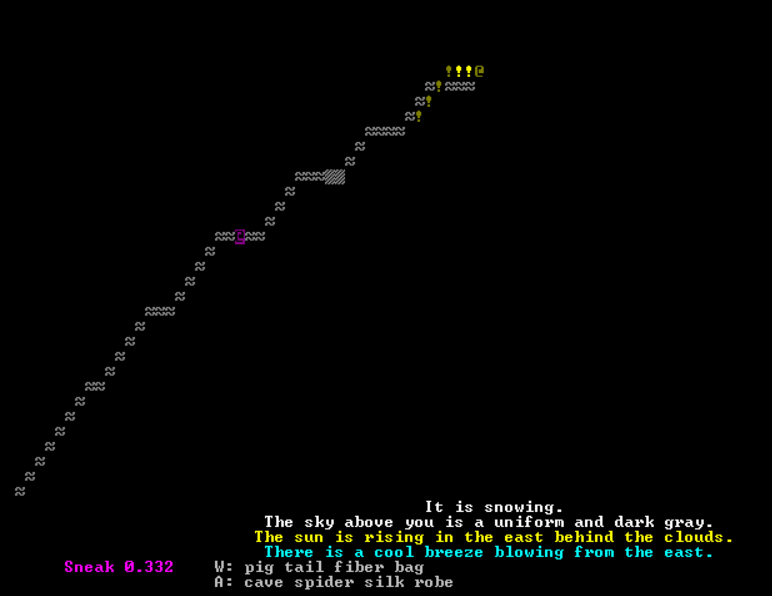 'Once upon a time there was a Dwarf called Medtob Masteredceiling. He was King of the Infinite Cheerful Crafts. 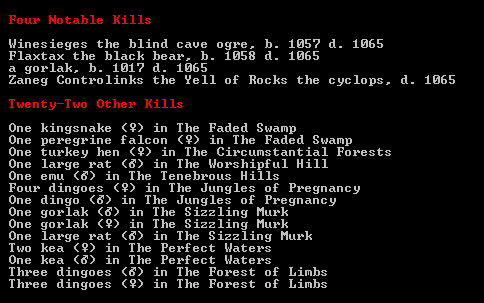 He was killed by the forgotten beast Asnan Skullmines. The end.' Cog told his tales with expert efficiency, excising all the pomp and nonsense to get to the true story beneath. Lesana was visibly sickened, cursing that her superior memory would likely burden her with this butchery of lore forever. She now welcomed the inevitability of death. 'What did you think?' Cog asked. 'The story was... Interesting.' Lesana replied. Thus Cog retold the story again, much to the polite protestation of Lesana. Eventually the tale-telling stopped and Cog began sorting out his inventory for the trek south or the descent into the caves. 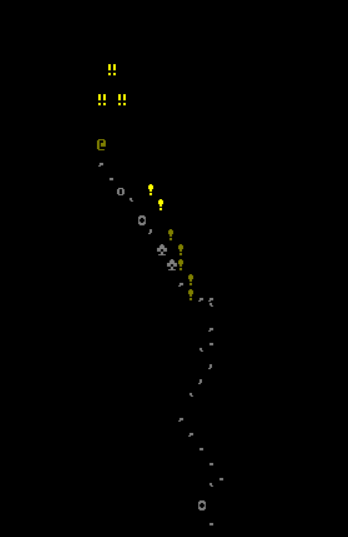 Anything that couldn't be used or wasn't light and valuable was left at the mouth of the cave, Cog then approached Lesana to announce the journey plan. 'Are you going to tell more stories?' Lesana asked, concern knitted in her face. 'No, we are just going to scout the cave and then camp here for the night. On the morrow - we descend!' Cog replied. Together they mapped out the cave's interior, the whole complex seemingly empty and secure. 'So how's the family?' Cog asked. 'My eldest son is married to some unknown creature. I do not wish to talk about it.' Lesana replied. 'It sure is dark down here,' Cog said. 'Aren't you blind?' Lesana asked, concerned. 'Why don't you seek out the great beast of comedy and kill it Lesana. Lesana?' Cog heard Lesana draw her wooden sword and shield as she leapt ahead, Cog continued sneaking around the cave wall trying to figure out what had just occurred, and whether he should be fleeing now. The Round-chin Ettin and Lesana both exclaimed in the loudest roars 'I have defeated many fearsome opponents!' Their warcries echoing throughout the cave. Cog thought Lesana was insane and as good as dead, picking a fight with a two-headed warrior that was twelve times her size. He snuck past the melee pausing only to pick up some sort of flower along the way, when he was stopped dead in his track by an unusual sound - the ettin screaming for help. Somehow, Lesana was winning. Cog dropped his supplies and drew his warhammer, charging into the fray. Try as he might however, the beast was too tough! Cog's warhammer failed to do more than bruise muscle, he could not strangle the two-headed beast to death nor did it seem to bleed to death or have a hide weak enough to tear. Lesana's wooden sword lacerated the ettin grievously but could not land a killing blow, Lesana refused to run from this doomed battle. The battle would be lost when the Ettin caught Lesana by the leg and broke her right knee; unable to maneuvre around the superior bulk of the ettin, she was thrown into a wall and killed instantly. The Ettin turned its attention to Cog who had no means of seriously wounding it, whilst a single strike from the Ettin would slay Cog. Picking up Lesana's shield Cog ran to a lower level where he hid his supplies and began sneaking away. The Ettin blocked the only exit and was descending down the ramp for him, Cog had no choice but to go lower. He reached moss and knew at once what this all meant. The cool breeze of a climate, the squawks and scurrying of things larger than him, the rich smell of mulch, decay and rebirth - this was the caverns. 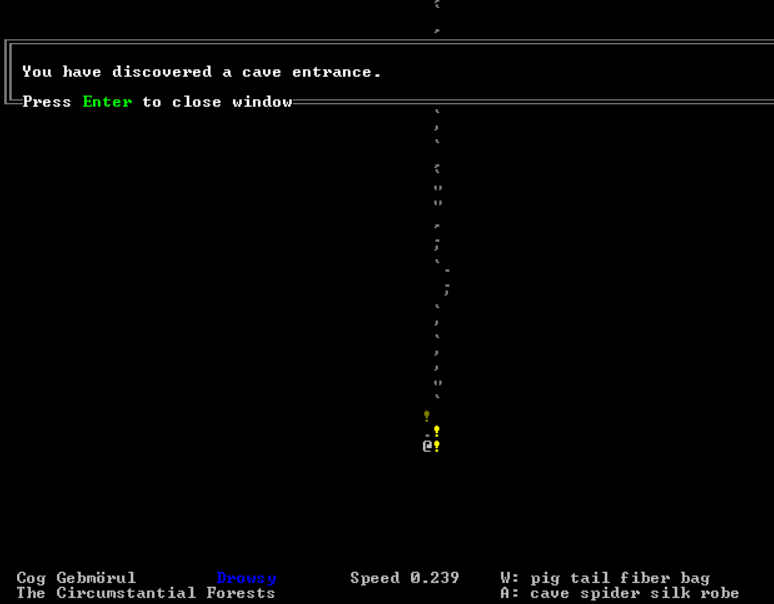 The only way out was to find another cave. On the 10th of Slate Cog made it... Somewhere northwards, direction, elevation and orientation is nearly impossible to keep track of in the caverns, but Cog always went in some vaguely northwards direction. Constantly sneaking and skulking through the rat tunnels, it should come as no surprise that Cog would be able to find a giant rat. A fine lunch! Sleeping amidst the fungus, getting caught in webs, avoiding giant toads and crocodiles - the 11th of Slate was to be mostly unremarkable, though it did mark the day when Cog made it farthest from the cave. Things took a considerable turn for the worse when Cog went to fetch water from a lake. 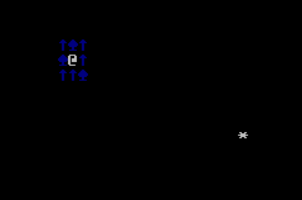 A cave crocodile emerged from ambush, its jaws around Cog's head. It seemed to be trying to figure out whether Cog was food or not - this saved Cog's life. Cog managed to free himself and sprint to safety, stuck on a muddy platform somewhere away from the crocodile. He rested to recoup from his wounds as unconsciousness overwhelmed him. 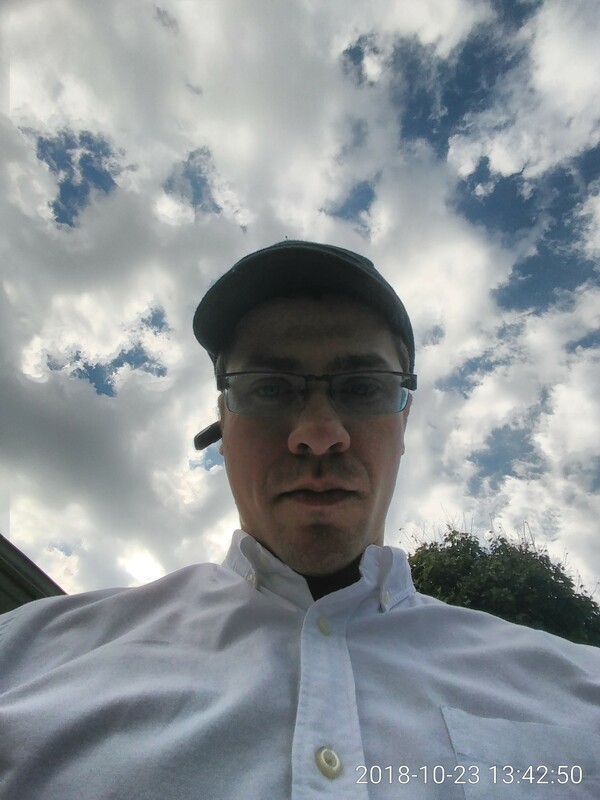 He slowly roused from his stupor hearing the gobbling of Turkeys and the warmth of sunbeams intermingled with a cool eastern breeze. He was lying in some grass. Was he dead? Was this the afterlife? 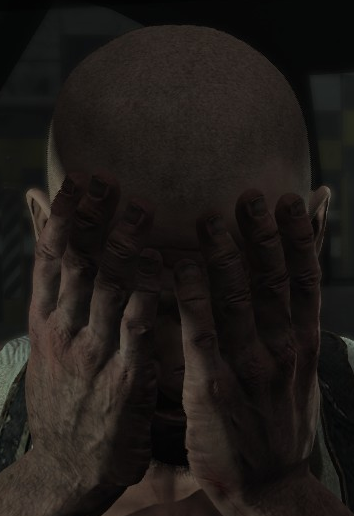 He felt his third finger, the broken one, it still hurt like hell. He probably wasn't dead. Maybe this was all a dream and it never happened? But Cog checked, he had Lesana's shield and some rat meat rations. He must've found some way out of the caverns, or worse - been dragged out, by an animal or some benign cave tribe. Night was falling. Cog would have to debate whether the gods were playing tricks on him or not later, the only shelter available was the cave. 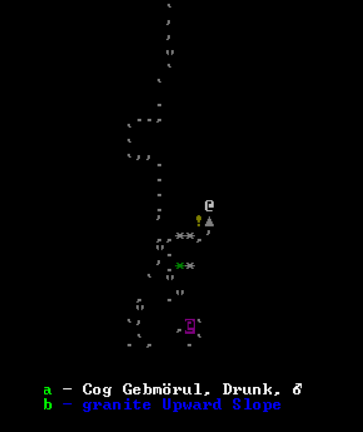 Cog made it back to Elven civilization, hopping from forest to forest until he reached one of the larger me-tree-politan areas. Some inquisitive Elves asked why he was traveling, a few offered kind or cautious words, with the only encounter of note being one moment where Cog stayed over at the abode of a crazy Elf. This Elf was completely insane, perhaps having spent too many centuries alone in their tree. Cog could not even hear any peregrine falcon nearby, perhaps the Elf was imagining things. The Elf didn't pay Cog much heed. Figuring that this Elf was just as good as any, Cog asked if they wanted to join his adventure! After consulting with what was possibly a coconut with falcon-shaped markings painted on, the Elf decided that helping Cog was not worth it. Probably right too. With that, Cog left 1,100 coconuts richer, beginning a short career as a humble coconut merchant. The great city... Forest... Thing? The Forest collection of Riddlepear was a wonderful thing to behold, so many Elves going about their lives with the bustling of gangsters, merchants and depressed lonely elves. Cog wandered through blindly, dressed resplendently in a pig tail fibre coat dashed in spikes of emerald, carnelian and marble, his head obscured by a midnight blue silk hood, a leather cloak and toga adorned over all enricled with bone and galena cabochons, an ornamented silver warhammer and willow shield strapped to his back, Cog was a veritable coconut merchant of immense value with merchants all around him vying for his wealthy attention. He didn't however, have much to spend his fortune on - so merely purchased a fine net's worth of a hundred mangoes. 'CocoNUTS Elf,' a ☼painting☼ by Nolimit, renown craftsdwarf. It depicts a coconut merchant talking to a coconuts elf hoarder. Cog traveled North alone with hundreds of coconuts, determined to cross the ocean. He would travel by the coast to minimise the risk of being taken by night creatures or predators in the dark, this way he'd stand a good chance of reaching the north without risking the lives of any more adventurers besides himself. Reaching the far end of the world, Cog set forth on the ice until he reached warmer waters - still cold to the touch, and terrifyingly deep. It was probably for the best that Cog could not begin to imagine how deep the ocean was, nor what lurked beneath the surface's skin. On a coconut raft he paddled Westwards to an archipelago, planning to hop from island to island until he reached the rumoured Elftropolis in the north, way past the Jungles of Pregnancy. Cog did not know why the Elves named it so. The strategy was sound. It took days of travel through jungles, hilly wilderness and sea, but Cog was beginning to get exceedingly good at trekking through the wilds. 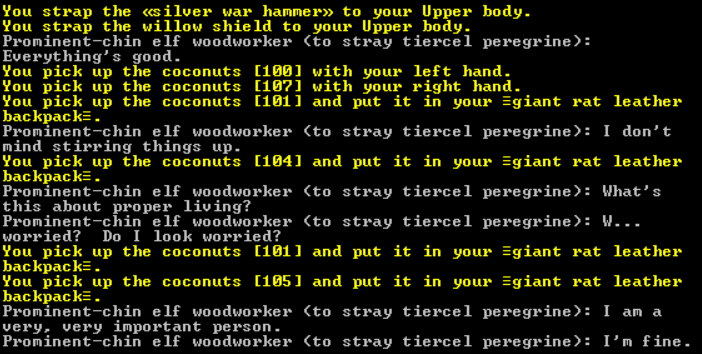 Cog almost couldn't believe his ears when he walked through the forest retreat, coconuts clacking gently as he lay down his coconut sack, listening in on what was clearly five elves of a culturally sophisticated nature having a culturally sophisticated discussion. With the keenness that comes from having not heard a single soul for so long, Cog quickly climbed up the tree to introduce himself and learn more about the island of Elves the world had never heard about. The chief source of help, information and interest was the Elf Clerk Dipane Ithayagica, who was the least surprised but the most interested in the visitor to their tree. They had never seen a Dwarf before, nor is it likely they had ever had a visitor from another civilisation before - so the Elf Clerk Dipane at once suggested Cog go see the ruler of the Riddled Tress Elves. Traveling from forest retreat to forest retreat, it immediately struck Cog how vast in scale the Riddled Tress Elves had claimed their island. The Riddled Tress Elves ruled a fraction of the land that the southerly Moss of Catching Elves or even the Infinite Cheerful Craft Dwarves ruled, true. But none could truly have said to have made a city of trees spread from coast to coast in the manner these Elves had - settlements were piled upon one another, testament to what a thousand years of peace will do to an Elven population. It was an urban-megacity of trees. The sheer scale of their capital was astounding. No less than thirty-six villages used the capital's market to trade - almost five times as many as any southern capital. Cog and Dipane talked for much of the day, genuinely intrigued in learning as much about each other's civilisations as possible. It couldn't have been a more hospitable welcome - as Cog left the forest retreat, he found himself joined by three swordselves. Liyiyi, Narena and Yare - an honour guard fit for a King, bestowed so generously on a Blind Drunk. Reaching the capital of Fraganceled, which was reportedly a delightfully smelling capital to the Elves (it just smelled like Elf to Cog), Cog climbed his way up a stout-feeling and large-seeming tree with his entourage of swordselves, which must have been a sight to see for all the bemused, stunned and concerned elves watching. The Elves were led by Queen Lebeyu Adoredsummit, one of the first Elves to have ever existed. According to the histories provided by Clerk Dipane, no one knew how old Queen Lebeyu was, nor how long she had reigned - she was one of the first Elves known to have existed and the Riddled Tress have never known any other Queen except Lebeyu. Courteous in the utmost, Cog and Lebeyu talked for ages warmly, exchanging stories about their lives and travails. It was astounding talking to this ancient Queen detailing the lives of her family in the isle where no one dies, whilst Cog in turn exchanged stories about slaughter, sacrifice and survival from the humid horrors of the south. Queen Lebeyu seemed to formulate an idea in her regal mind. Looking at this scar-ridden, muscle-laden, coconut-strapped, hammer-wielding, tattered-cloth wearing, skull-collecting, Ogre-slaying, ocean-crossing, wilderness-braver, badger-butcherer, body-burier drink-drinker of a Dwarven adventurer, she brought up a certain issue she'd been dealing with for 982 years. For 982 years the Cyclops known as Zaneg had been at war with the Riddled Tress, making his home in a cave in the southeast of the island, not too far outside the outskirts of the Elfopolis. 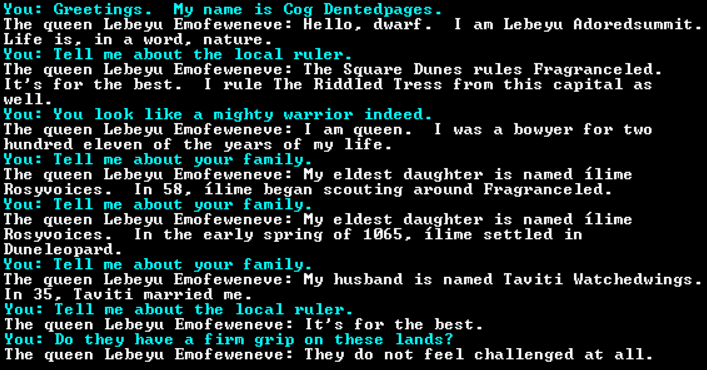 This Queen of unchallenged rule was nevertheless challenged by the existence of the mighty Cyclops Zaneg, who brazenly lived a day's walk from the Elven capital, occasionally launching devastating assaults upon Elvenkind. 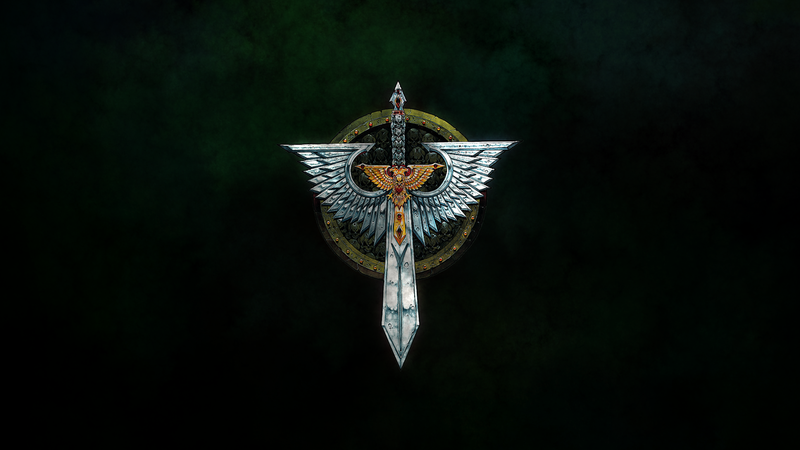 Zaneg was associated with thunder, strength, minerals, longevity, lightning and light - a verifiable accursed demigod in his own right, undefeated and uninjured over a thousand years of warfare with the civilised races, with over a 128 kills attributed to his name. With three eager swordselves by his side and all of Elfkind watching Cog - he knew he had to make his fist impression count, if he was to put in a good image for all the Dwarves back home. 'That Cyclops is dead meat, I promise you,' Cog declared to the Elves. The Elves cheered tremendously from tree to tree, salivating over the prospect of roast Cyclops meat, taking Cog's declaration rather literally. A short drop down the Queen's tree and Cog was marching along with his retinue to go kill that Cyclops - and he said he'd do it for free. 'Cog, the cave is that way,' Narena said. 'I know where I'm going,' Cog said, going the wrong way. Eventually he did a 150* turn and found the cave entrance, creeping down, listening in curiously at the sound of battle going on. 'How big is the Cyclops?' Cog asked. 'It's about 120, maybe 125 times larger than you?' Liyiyi told the Dwarf. Its scraggly faced contorted into a wicked smile. As the warparty snuck up on the Cyclops, they observed Zaneg bragging about the long list of warriors who had fallen in battle against it. Cog had to admit; it was a respectable, lengthy list seemingly without end. The general effect this had upon the Gorlak being beaten up by the Cyclops was to make it flee in terror to its other Gorlak allies, who in turn fled directly into Cog and the Swordselves. The Gorlaks were despatched with ease, though they were never the primary attention of our hostility to begin with. The Cyclops Zaneg turned its hateful eye towards the invaders in its lair with a mix of anger and amusement as the Elves hacked their way through Gorlaks to try and slay the #1 Elf-slayer in the island. The Gorlaks ran away, Cog overheard one of the Gorlaks speaking to a pet rat about his mighty battle against Cog Dentedpages. Truly, Cog's reputation would spread even through the underground world now. With the Gorlaks mostly out of the way, the Cyclops was free to charge into the Elven forces - that was when Zaneg noticed the peculiar figure with them. It was shorter, stockier, angrier and it carried a curious silver weapon instead of a wooden one. Zaneg recognised it - he'd seen humans, goblins and dwarves before, and he knew a dwarf when he smelt one. The Cyclops lunged clumsily, powerful arms missing their intended target. The Elves poked it with their wooden swords whilst Cog rushed in close, taking a swing at the Cyclop's right leg with a powerful strike. Zaneg's leg broke, toppling the Cyclops painfully onto the ground. Enraged, the Cyclops continued to boast of all the people it had killed and how Cog and the insignificant Elves would all soon join the list. Whilst the Cyclops boasted and did its best to swat the Elves and Dwarf away, Cog clambered up towards Zaneg's head. 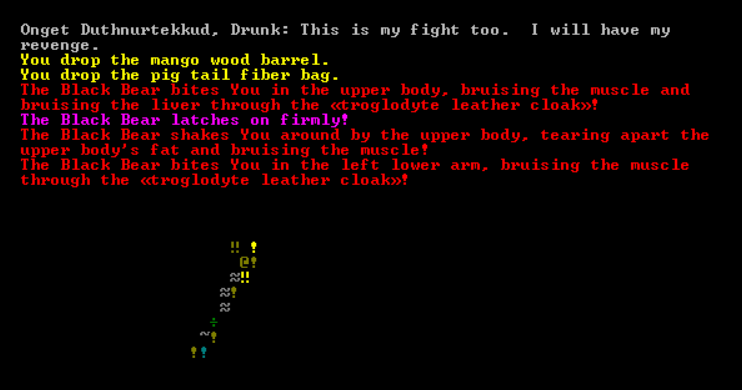 Staring face to face with the Blind, Drunk Dwarf, the Elf-killer Cyclops Zaneg managed to utter his last words before Cog gouged out Zaneg's sole eye. 'I am the foe of Zaneg Controlinks the Yell of Rocks, whom I buried alive under a mountain of hatred! Cog shouted in triumph a fell roar, causing the three Elves to shirk slightly at the sight of the blood-soaked Dwarf. This would surely be a tale remembered and retold by the Elves for a very long time, as they watched the Dwarf repeatedly smash the dying Cyclops in the head with his silver warhammer. 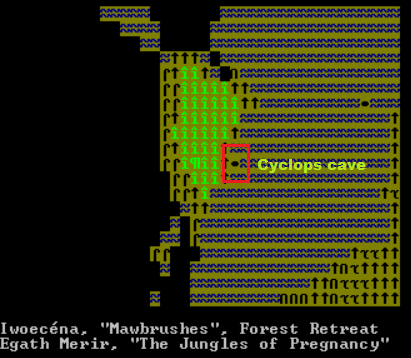 The carnage was all a bit much for the swordselves, who waited outside the cave while Cog finished killing the Cyclops. Reporting to the Queen the great success of the battle, Cog went from borough to borough, visiting every settlement of Elf Island, bragging of his exploits or telling them the stories of the southern adventurers. Cog was even starting to get pretty good at storytelling too. Confident in victory, Cog sought out the Hydra known as Stingbol - but no one except the Elf bowman Masami Cananaquifa knew where the hydra lived. Tracking down Masami Cananaquifa was an astonishingly difficult task, and with immense disappointment I found that Elven politics was to frustrate my battles against a hydra. Having tracked down Masami, Cog discovered that Masami refused to divulge the location of the hydra, lest Cog's glory outshine his own. With no more villains to slay, Cog bid all of the Elves adieu. Cog knew he could comfortably spend the rest of his days telling these Elves his tales, so he'd have to move on before he got too comfortable. Past the Fiery Continent, a series of brutal deserts and forests, Cog once more set forth on the frozen ocean - this time on his longest voyage. Perhaps cursed by some cruel god, Cog would spend far too long trapped in the ice. Crashed on an iceberg, Cog would shiver in the cold, surviving off of the insulation of his coconuts, waiting for the chunk of ice he was trapped on to drift onto dry land. Salvation would at last arise with the unmistakeable sound of the waves crashing against the shore - and even more, the certain smell of Elves on a seaward breeze. 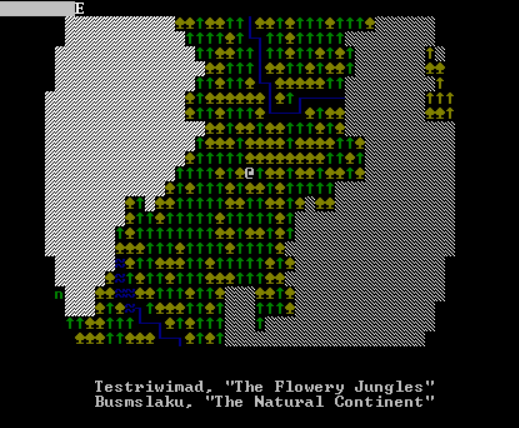 Not only had Cog survived the journey, but he had managed to land on the coast of an Elven civilisation. Cog made landfall in the late-morning, there would be enough time to reach the city before night fell and horrors emerged from the dark. 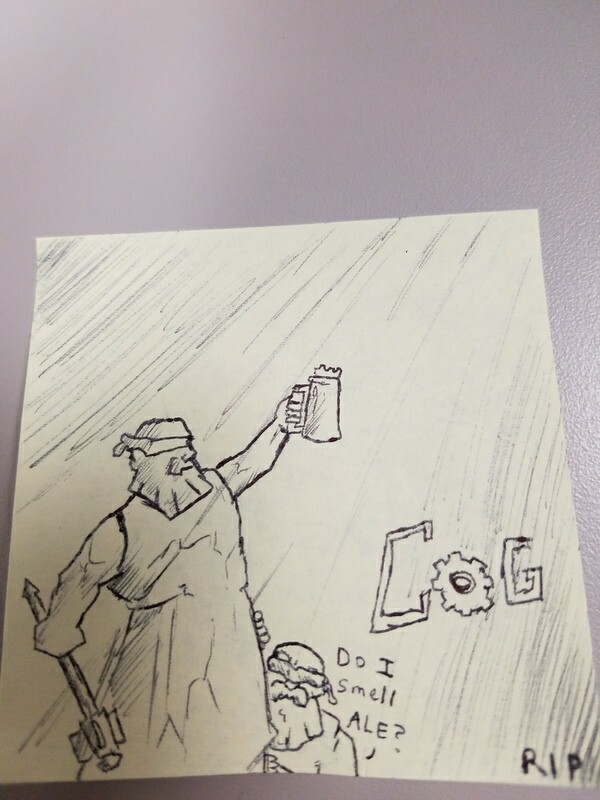 Whatever challenges would face him in this new shore, Cog was not the Dwarf he was when he started the Odyssey anymore. 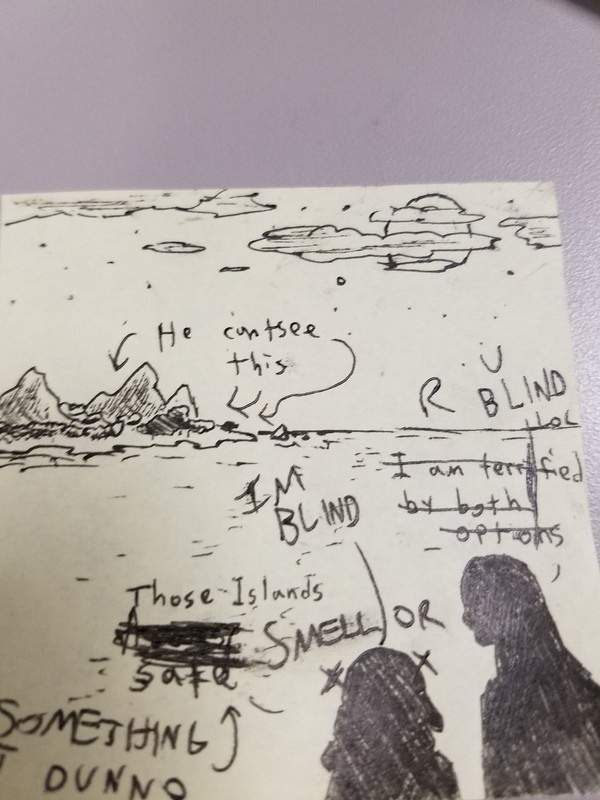 The journey left him impossibly tough, mentally ironclad with a seemingly superdwarven ability to navigate the world blind. He was something of a legendary conversationalist from his time with the Riddled Tress Elves, while his skills with the art of close-quarters combat were starting to give him confidence. His clothes were beginning to show the wear and tear of arduous journey, he would have to find some new ones somewhere. Checking his supplies, Cog still had over a thousand coconuts and 150 assortments of mangoes, pears and lychees with which to feed himself and trade with locals. And if he were to encounter bandits, brigands and beasts along the way - his silver warhammer would have something to say about it. Posting to watch the glory.